Feeling better is a skill. All you need to become really good is the decision to hone that skill. The more you want to feel better, the easier it gets to make it so. Although it may seem like “work,” this is the most effortless skill you will ever access. 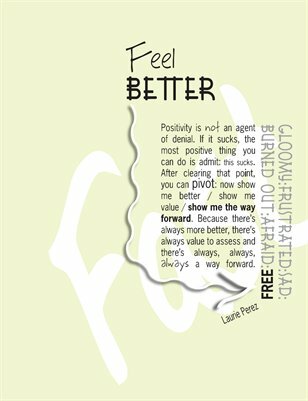 Excerpt: Feeling better is not about . . . fixing, solving or figuring out the whole complicated mess. The objective is breezy and simple: find a way to step out of the mud and coast into a more useful frame of mind. If there’s something to fix or solve, you’ll line up with the insight you need after you’ve started to move forward. FYI: "Read Sample" only works if you're logged in with a MagCloud account and have downloaded your Free copy. Click PREVIEW if you want to peek otherwise.